Interested in what Trinity is doing during Holy Week? You can find all that information by CLICKING HERE. The first of Trinity’s three Easter services will take place at 6 AM at the Outdoor Chapel. 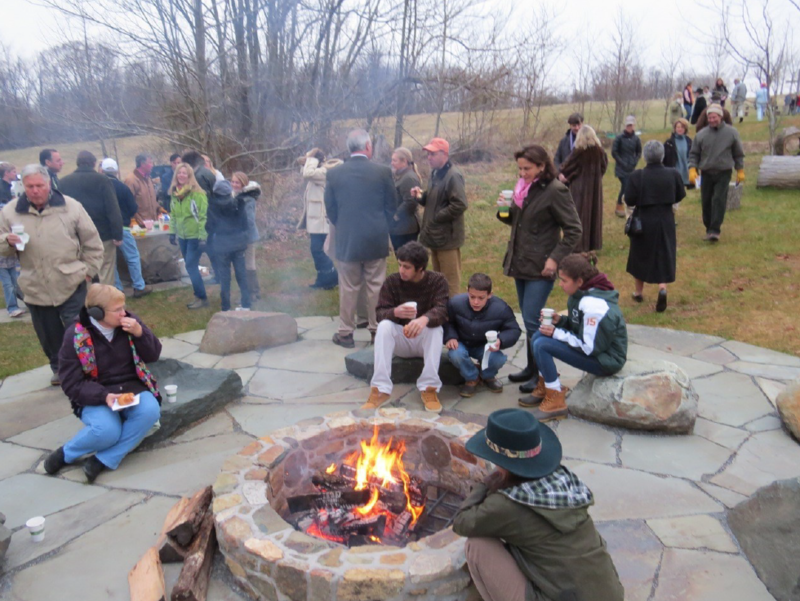 Those wishing to make their way to the Outdoor Chapel together should plan to meet in the church parking lot at about 5:50 to walk to the Outdoor Sanctuary together with Ed. Please bring a flashlight as it will still be dark. If you are concerned about walking to the Outdoor Sanctuary, the Trinity van will be available to transport you to the service. The van will depart the church parking lot at 5:55 AM on Easter Sunday. Our worship service begins at the Council Ring where the fire will welcome worshippers, and our prayers begin. After we light the Paschal candle, the congregation will process to the cross for the rest of the worship, and hopefully will greet the rising sun. The service consists of readings, songs and a homily. Communion will be celebrated at the 8 AM and 10:30 AM services only. Please invite your friends and neighbors to this service, as it is a great opportunity to encourage ecumenical community worship. Also, after the service has been concluded, please feel welcome to return to the council ring and linger by the fire for coffee, hot chocolate, juice, donuts and Easter fellowship. On Easter at Trinity it is our tradition that everyone would bring a dish to share for our coffee hour. Join us after church in Cox Hall for a wonderful spread of food, and for the Easter Egg Hunt at noon! During Holy Week, the Holy Eucharist will be offered at noon on March 26, 27, and 28. 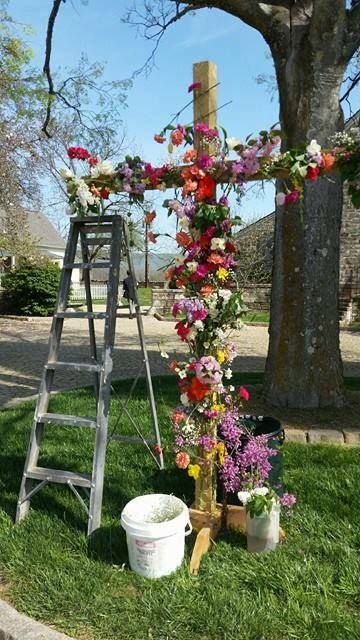 All members of the Flower Guild are invited to help decorate the church for Easter. We will meet at the church at 9 am on Saturday March 31. Please bring flowering branches (forsythia, dogwood, etc.) as may be available. Thank you. The flowering of the cross has been traced back to the 6th century. It is an especially striking and beautiful way to symbolize the new life that emerges from Jesus’s death on Good Friday. Traditionally before the Easter Sunday service, the cross is covered with real flowers and the top draped in white. The entire cross is covered with flowers and is placed prominently at the front of the church to symbolize the new life in our risen Lord to all the worshippers present on Easter Sunday morning. The contrast between the starkly bare cross that worshippers have seen for 40 days and the living flower cross of Easter Sunday dramatically and visually represents the new life that we are celebrating after witnessing the very instrument of death and endings transformed by Christ's rising. This year, as you come to Easter Sunday Service, pause by the cross and add some flowers to it. You can bring flowers from your garden, or you can place flowers from the bucket provided by the Flower Guild. The Sunday School children and Youth Group are encouraged to participate. Wednesday, February 14, 2018 marks the beginning of Lent, a season of reflection and introspection in preparation for Holy Week and Easter. The services will include both the Holy Eucharist and the imposition of ashes. During the imposition of ashes, the rector will take ashes (from the burning of the previous year’s Palm Sunday palms) and will make the mark of the cross on each congregant’s forehead. The imposition of ashes is a reminder of our mortality, and our total reliance on God. On Easter at Trinity it is our tradition that everyone would bring a dish to share for our coffee hour. Join us after church in Cox Hall for a wonderful spread of food, and then stay for the Easter Egg Hunt at noon!